Today marks the beginning of Delhi Literature Festival - a festival dedicated to the love of writing, reading and ofcourse both together bringing the best of the worlds together to give one a time of life! The first edition of the Delhi Literature Festival 2013, was held on 8th and 9th February 2013 at the Indira Gandhi National Center for the Arts, NewDelhi which proved to be a huge success. The Festival was Inaugurated by the Hon'ble Chief Minister of Delhi Smt. Sheila Dixit in the presence of the Italian Ambassador and had participation from over 40 prominent authors for panel discussions, book launches, poetry reading and interactions at the venue. It received great response, support and participation from authors, publishers, bloggers, other literary figures, Embassies, Government bodies and general public especially the youth. Delhi Literature Festival 2013 was presented by Unnati Fortune Group in association with Hindustan Times, India's leading daily newspaper. It was also actively Partnered by Tata Sons, Nokia, Panasonic, ABP News, Big FM and many more. This year. Delhi Book Lovers is proud to be associated with the festival! Delhi Art, Culture & Language Department, ICCR and Delhi Tourism, Government of Delhi were also Key Partners for the Festival. This year the Chief Minister, Mr. Kejrival is part of our concluding session. Motivated and highly encouraged with the colossal response during the first edition, the 2nd Delhi Literature Festival has been planned for the 7th, 8th and 9th February, 2014. Delhi Literature Festival is one of our many initiatives to promote the literary world amongst all and also provide a platform to encourage and promote the young budding and independent authors and publishers. For more details please visit HERE. Description: Dr. M Veerappa Moily, is also a literary figure having received the prestigious Moortidevi Award of Bharatiya Jnanpith. He has authored several books in Kannada. Mr. Moily will officially flag off the 2nd Delhi Literature Festival 2014. Description: Rajender Yadav, who recently passed away in October 2013, was one of the most well-known writers of Hindi language. He is most known for pioneering the Hindi Literary Movement – Nayi Kahani. He also revived Munshi Premchand’s Magazine Hans in 1986 and has extensively written for the cause of Dalits, Women, Rural India etc. through it. Speaker/Guest: Namvar Singh, Ajit Kr. Chaudhary, Rachna Yadav, Dr. Nirmala Jain (MODERATOR). Description: A session to understand how the form of criticism is changing with the advent of new media. Anybody can put up reviews and views about literary works and also indulge in conversations through social media networks, personal websites and blogs. The authors and writers get almost instant feedback, direct from their readers. How is the conventional way of criticism giving way to the new digital medium will be discussed by the panelists. Description: Keeping with the tradition of promoting independent writers and publishers, DLF 2014 will see a dramatic reading of a yet to be published novel, Mutilator. When passion makes you question your sexuality and your vocation as a scholar, you know you are in trouble. And that is what happens to Hilda, an anthropologist who arrives in Abhujhabad to study Bibi Mastan, a female genital cutter. What starts out as an admiring study of her idol, turns into a tumultuous journey of doubt, disbelief, and dissatisfaction. Description: Holy Smoke, It's a Godman is a first person narrative delivered from a jail in Copenhagen. In autobiographical mode, it invites the reader to take a journey across India with Jogender Dutt alias Redney Yog, a boy from Rajasthan who runs away to Mumbai and due to a series of bizarre circumstances, lands up in an ashram in the Himalayas where spirituality is merely a cover for nefarious activities. And then onto Denmark, to marry a gorgeous blonde and merge into a 21st century hippie community. Description: MRIGYA is an Indian World fusion music band from New Delhi which was formed in 1999. Its music is a fusion of Blues, Folk, Funk, Latin, Rock and Jazz along with Indian classical music. Description: A talk by an author, book club founders, readers and aspiring writers on the growing culture and popularity of Book clubs and how are they beneficial. Description: A tête-à-tête between Publishers, Authors and their Agents to explore and understand the pressing issues faced by all of them today as they voice their concerns and get confronted in return. Description: A platform to hear the journeys of Indie and Self Publishers. Description: Exploring the most visual form of literature which is fast gaining popularity and a cult/geek following. Description: Mamta Kiran will probe into the literary life of Kusum Ansal in a conversation with her shedding light on her works and style. Description: Bernardo Carvalho is a Brazillian novelist, playwright and is also a journalist. He will throw light on the Brazillian Contemporary Literature and also talk about how he shifts from writing fiction and writing objective news reports. 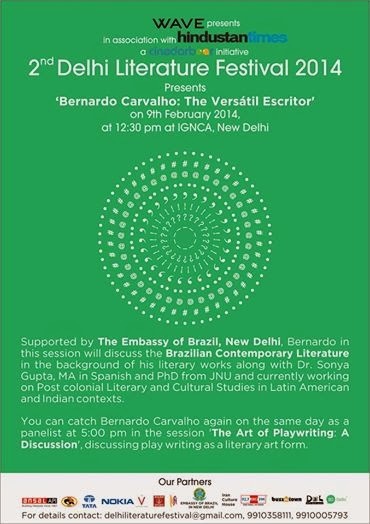 Dr. Sonya Gupta, MA in Spanish and Ph.D from JNU and currently working on Postcolonial Literary and Cultural Studies in Latin American and Indian contexts, will delve into a conversation and interaction with Carvalho. Description: Writing erotica is itself being a rebel in the Indian society. The session looks into the social and personal lives of these daring writers who often have to use pen names and face the brunt of the conventional society. It will also try to understand through these authors, the art of scripting an erotica. Description: The session will aim to understand how New Media has changed some rules for the literary world. From marketing to criticism and direct feedback from readers, authors have taken up new media platforms in full swing for all of these. New Media has not only changed how people promote their works but has affected the writing style too. It has created trends that gained popularity worldwide in short time. The session will explore the power and revolution of the New Media and how it has affected things. Description: Jana Natya Manch will pay a special tribute to Safdar Hashmi through a Play reading session by its members and actors. Description: The session will discuss playwriting as a literary art form, the challenges being faced by the playwrights and the art form itself and also its changing face today.